You could have had one for yourself! On a clear day, I can see this one from my home office desk. Here is the story of a lighthouse attacked by Indians. My Mother told me this story when I was little. I spent much of my youth around Cudjoe Key, which has American Shoal tower nearby. Same sort of screw pile construction as the OP posted, and same type as Carysfort Light up near Key Largo. Amazing that 150-odd years later the iron structures still remain. One would think the iron would all be rotted away by now. No interesting tales to go along with this lighthouse but many years ago kids used to climb the ladder to the top of the black platform to dive off. I would never admit to that because it was illegal. One kid I knew from high school got inside the black base, climbed the ladder to the top and dived off there. On the way down he barely missed the side of the black base, clearing it by only about 4'. Scared the crap out of all of us. 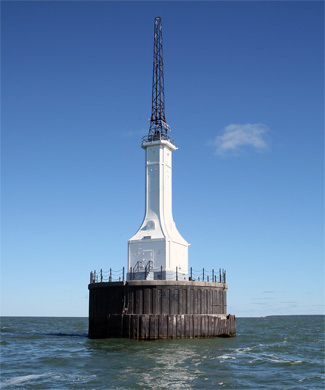 It sits in Saginaw Bay, part of Lake Huron.